“I have a Spider lamp shade that I want to incorporate into my bottle lamp project. All the bottle lamp kits that I’ve seen so far only work with the Slip fitter lamp shades. Can you recommend a bottle lamp kit that will help make this dream project a reality? Peg, we got you covered! 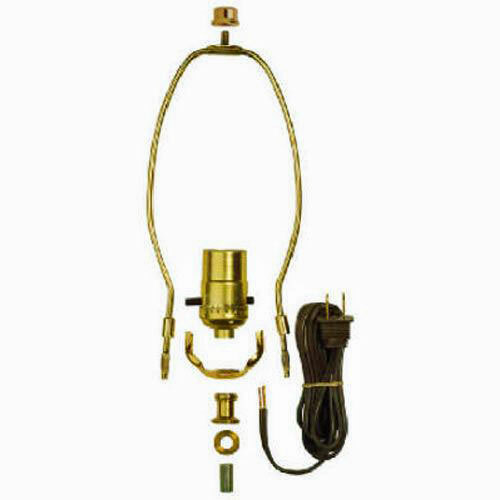 The Westinghouse Angelo Brothers Make A Lamp Kit is going to fit the bill for your project. One of the first things that you will notice about this particular lamp kit is that the little rubber stoppers that fit into the neck of your bottle are missing. A little creativity will help solve that problem. If you have the stopper for the bottle then you can simply use it. I’ve fitted several bottle lamps with the bottles original cork. By simply drilling a hole large enough for the threaded rod to fit through, you will be able to create a solid base for the lamp components. No bottle stopper? No problem. You can purchase silicone tubing by the foot. When your purchasing your tubing you will want your inner dimension (ID) to be 3/8″ to accommodate the threaded rod. You outer dimension (OD) will be the size of your bottle’s neck. If you order your hose with the kit you will be able to complete your project all at one time. Your local hardware store might also carry this as well. Once you have everything together, you will measure your threaded rod and cut off a piece of the rubber tubing to 2/3 the length of your threaded rod’s length. Pull the rubber hosing over your threaded rod into the middle to allow for the top and bottom parts to be threaded on. When you tighten the top piece you will be causing the rubber tubing to expand offering you a nice snug fit. A little ingenuity will allow you to use the lamp shade that you have with the bottle lamp that you want to create. We would like to thank Peg for sending in her question. If you have another idea that you would like to share please leave us a comment in the section below.